A £30m open-air historical show in County Durham has attracted more than 100,000 visitors in its first season, organisers have revealed. Kynren depicts 2,000 years of English history in 90 minutes, utilising 1,000 volunteers on a specially-built site in Bishop Auckland. It is part of a £100m redevelopment of the town spearheaded by former investment banker Jonathan Ruffer. It is thought the 15 summer shows have generated about £4.5m for the area. 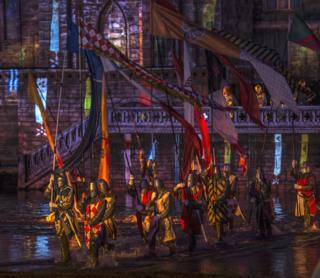 Kynren was inspired by one of France's biggest tourist attractions, the Puy du Fou, and features marauding Vikings, sword-wielding knights and dancing coal miners. The opening season ended on Saturday with organisers promising the event will return "bigger and better" in 2017, with an additional 500 volunteers. Anne-Isabelle Daulon, chief executive of Eleven Arches, the charity that produced Kynren, said: "We are thrilled that so many people of all ages and from far and wide have enjoyed the show. "The scale of our ambition was audacious, if not daunting, and we believe we have pulled off something quite incredible - not just the quality of the show itself, but the positive impact it has had on the community."